* Watch one of the HD versions if you have a fast connection. The HD quality is much better even though in this case you’re really listening to the sounds rather than the picture. Hello there! I have watched this video about 15 times now and really wanted to share it with you all. The other day Mark observed some queen behavior he had not witnessed before and he even managed to capture it on video. I am so happy! As I watched it over and over and listened to the sounds, Mark pulled out some books and read up on the sounds and behaviors. The first sound you hear is the roaming queen “piping” a challenge to another queen. In this instance, the other queen is a young one still in the queen cup you see on the frame later in the video. In response, the young queen in the cup will make what is called a “quacking” call. See if you can differentiate the different calls. Hope you enjoy this as much as we did. 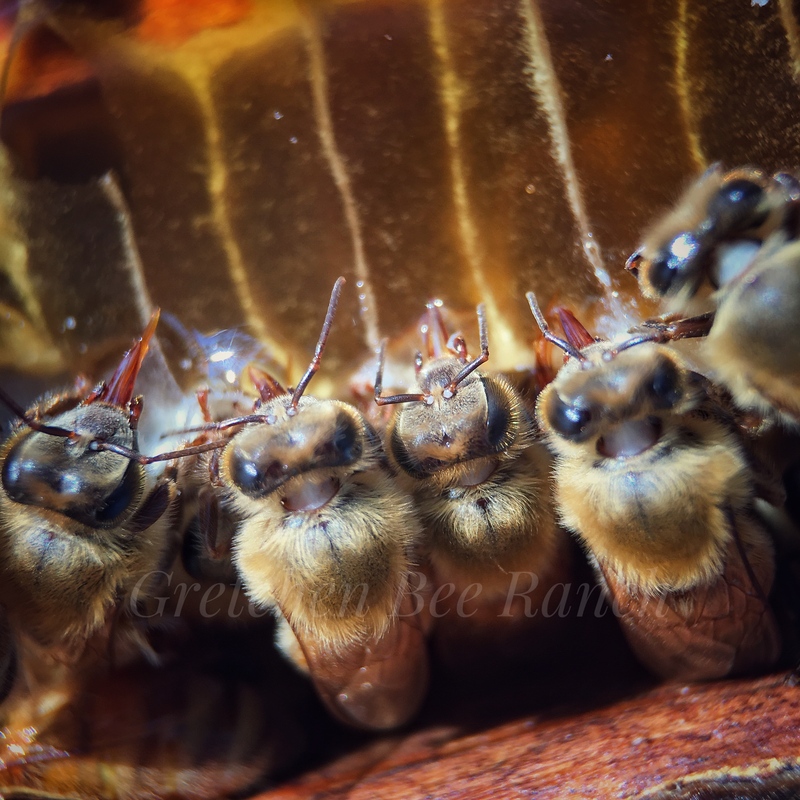 The bees are constantly fascinating us and we love it! This just in: It’s bonus day at the Bee Ranch! We just received an email from a Texas A&M student that Mark first met at the Pearl Farmers Market. Alison shot a video there of her interview with Mark and then she joined us at the Bee Ranch when we had the advance class (How to Build Up Your Hives for Spring) for folks who were picking up their nucs. 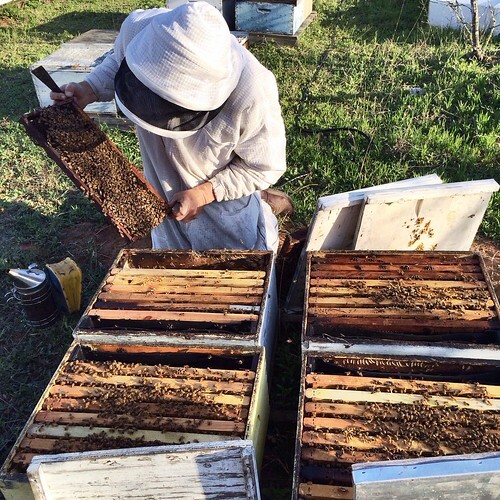 It covered more than just transferring the nuc frames to their permanent homes and we are seriously thinking that if we continue to sell nucs in future, we may require this class – it hurts when nucs end up dying (for different reasons) on those folks who chose not to take a class (especially newbie beekeepers). Requiring the class may also cut down on the amount of emails and phones we get from worried parents wondering all sorts of things about their nucs. Anyway, that’s a different post really so here’s one of the videos Alison recorded when she visited us. 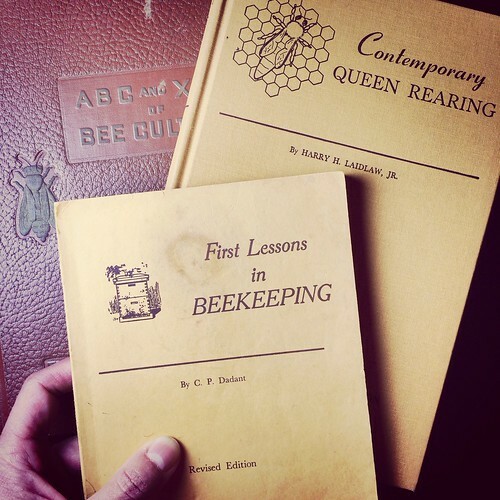 This one is about the importance of the Queen Bee to the hive. I love that she came to do this on a day when I could not observe the class since we had nuc customers to tend to at the same time class was held. Thanks, Alison! We enjoyed your visit. Good morning and happy Monday. We survived one of our biggest weeks and weekends. Yay! Thanks to all our friends and family who helped us through it all, from working the bees with Mark to going to market so we could distribute nucs and conduct our advance class. Overall it was great and we appreciate people being so interested and eager. We did learn some things from a few interactions we had and we’ll be analyzing things moving forward from this year on. I wanted to post and since I want to keep things positive for our week kick-off, I thought I’d just share some recent photos that make us happy, amazed and thankful we get to work with such amazing creatures. In the picture above, those are queen cups the girls have prepared in the event the need to make some queens of their own. 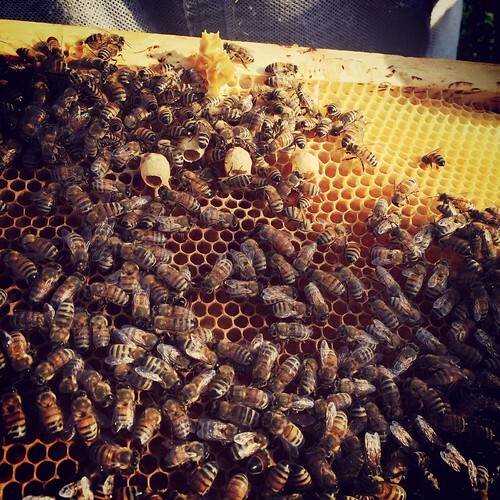 I love seeing queen cups and queen cells. 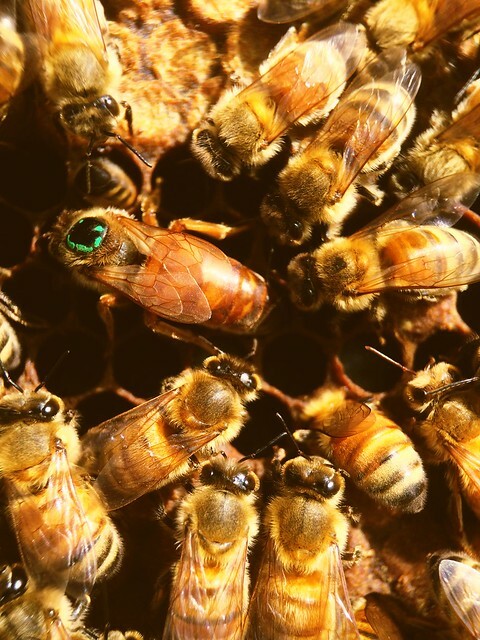 It’s so neat to think what’s happening in there – a little bee could be growing up to be the mother of her own hive. Think about how many babies she might have and how much work they’d accomplish in their life. Pretty amazing. Next I wanted to show you a cool shot Mark got out at Coyote Creek a couple of weeks ago. This has never been one of our stronger yards so we are pretty excited to see how booming the hives are this year already! Maybe this will be the year these girls take off over there in Kingsbury (not too far from us). 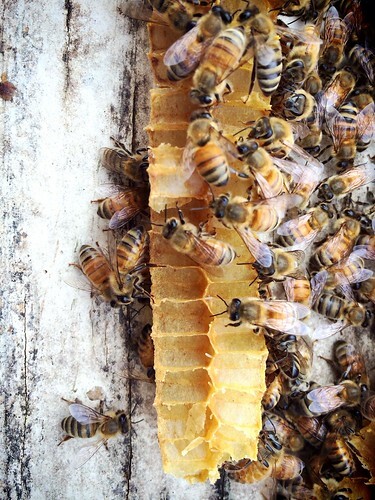 This particular hive was growing so fast that the girls made cells on the lid, using every bit of space available. 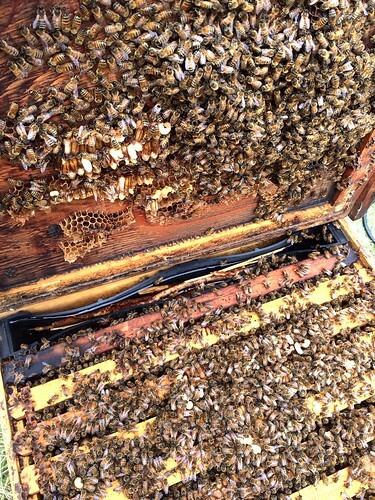 The queen then laid eggs in those cells, which is what you are seeing now. Sometimes, when you break open the cells accidentally, it does allow you to see and learn even if it means those few bees won’t make it. 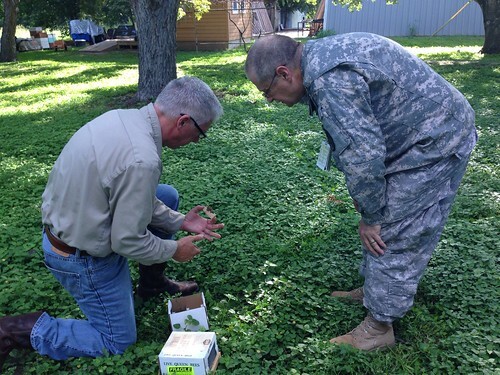 Sometimes we purposely open cells to check the larvae to see if mites are on them so we can take action. In the picture below, however, I was thrilled when Mark showed me the teeny, tiny eggs in the cells! Loved it. It just totally mesmerized me to think about those tiny girls. Yesterday after work, Mark drove up as I got home from work. Luckily for me, I caught him between bee yard visits and after he unloaded a hive out by the Honey House, we headed out to Big Oaks. What a treat for me!!! I hadn’t been out there again since we unloaded the nucs and at this time of year, I always want to go out and see what’s growing and blooming. I wasn’t disappointed. The bees were looking good and there was a good variety of wildflowers starting to bloom and trees (and wild grapes) starting to bud out. Yay spring! The nucs are mostly coming along fine. There are a few that don’t look great but those will just stay and keep getting built up more. We have our first round of pick up this coming Saturday and we are super excited about that. 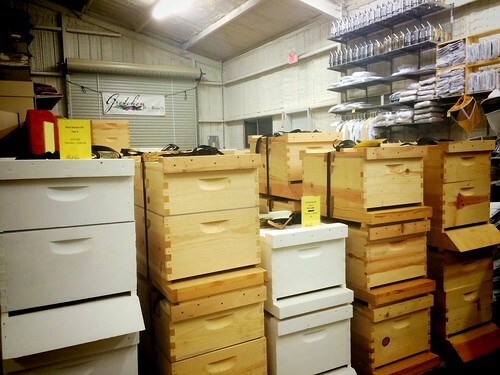 People are really interested in the bees and keeping some on their own which all serves to meet our mission of replenishing honeybees to our region. Hopefully they will enjoy it as much as we are. In the picture above, Mark is inspecting the nuc frames to make sure there is good brood and eggs being laid by the queen. I love watching him work – he really gets into it and focuses on what he’s doing and we hardly ever speak. He’s busy tending to his bees and I’m busy getting to do what I love – observing him, the bees, and nature around me and photographing whatever I want. Speaking of queen, we got our 83 Big Island queens in last week. It’s always an anxious waiting game when you know they are coming but not exactly the time and so nothing (well, very little) gets done away from the Bee Ranch just in case the delivery man (UPS usually) arrives with them. Luckily for us, that day, he came while I was there for lunch so I was able to watch Mark anticipate him, meet him out in the drive and then wait by the truck as he fetched them from the back. 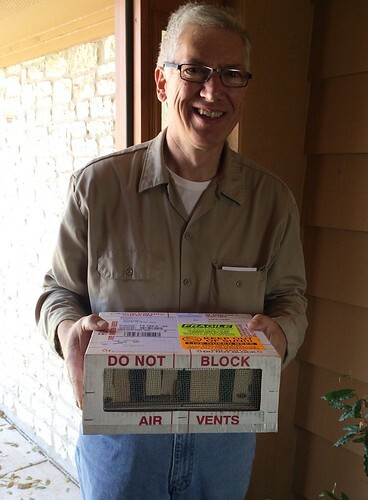 Here’s the happy beekeeper. Here’s the worried me wondering why I don’t hear the melodic humming of queens and attendants as I have with past batches. We figured it was because they got a little chilled riding around in that open UPS truck. It was on the cool side that morning. Once they warmed up sitting on the kitchen counter while we lunched, they started humming a bit. Or buzzing is what most people might call it but really, the sound is much more like a constant hum. At any rate, it’s quite soothing. 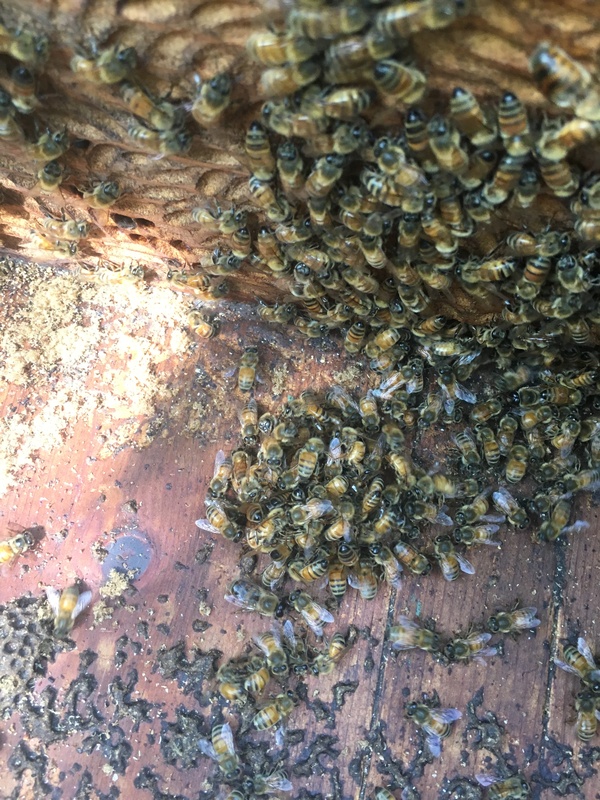 Here’s a look at the queens once Mark got them all placed into the queen bank, which is a temporary home for them while he goes about installing them into hives he’s identified as needed to be requeened at his various bee yards. 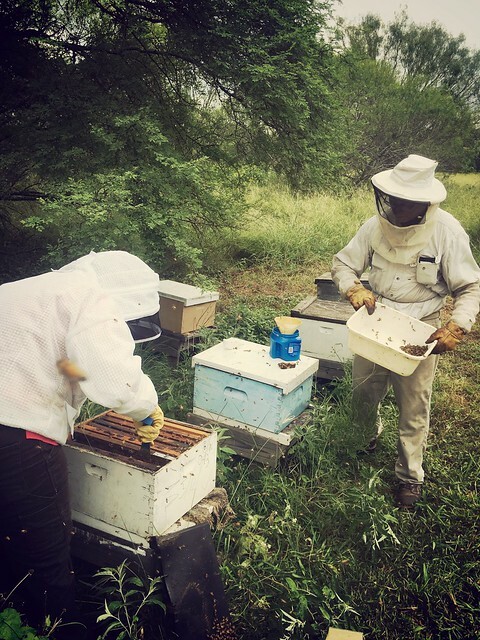 It looks like we will have about 20 extra queens at this point so if you need a queen, let us know (830-305-7925) and we’ll see about setting you up with what you need. 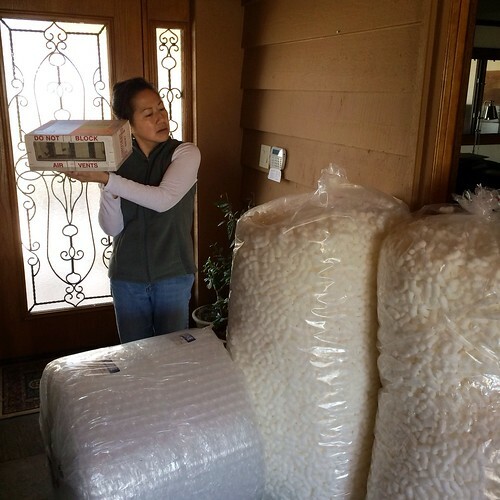 At this time, they run $30 a queen and we’ve used Big Island quite a bit and have been pleased with their queens. 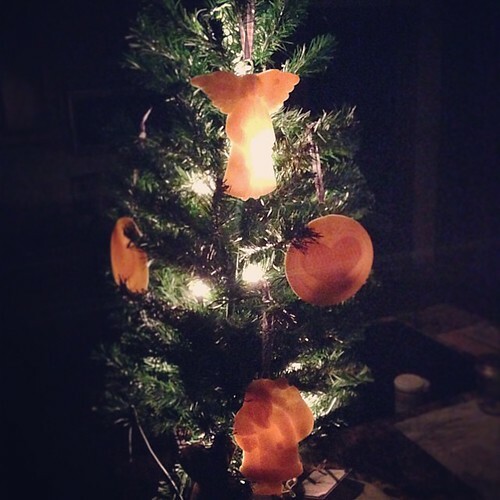 This is us testing the impact of Christmas light heat on the beeswax ornaments. So far, no impact. Good. I never know where the days melt away to from Monday to Thursday night. Isn’t that interesting? Last thing I recalled, it was Sunday evening and I was relishing the relaxed hours after market and before the official work week kicked in the next morning. Anyway, here we are. 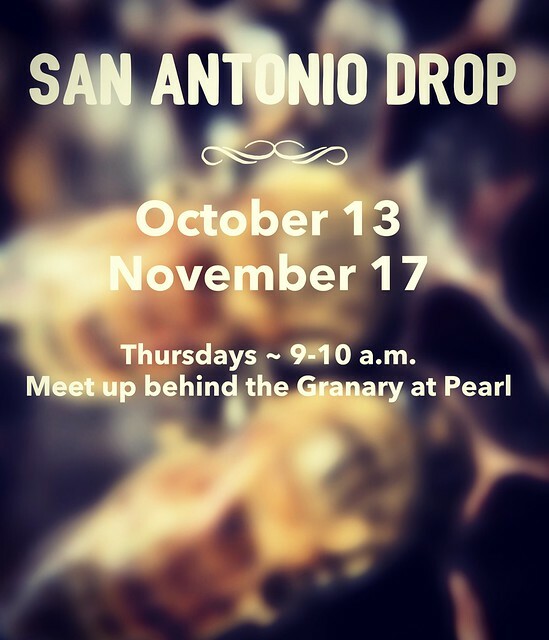 Time to get tags together for Creamed Honey jars, prep supplies such as spoons and postcards, box up the bottled honey Stan got ready for us during the week…oh yea, and gear up to do a new DOUBLE TENT set up at Saturday’s Pearl Farmers Market. We are thrilled to give it a try and now we’ll have Sunday to rest a bit. We are on Quarry Market sabbatical until further notice. We have got to have a little rest now that the harvest is over and we just really want to be back with our church family for a while. We really miss them. So while we will enjoy sleeping until at least 7am one day out of the week, maybe even 7:30am (!!) and seeing our church family, we will surely miss our Quarry market family for a while. We’ve met some wonderful, wonderful people and feel so blessed. 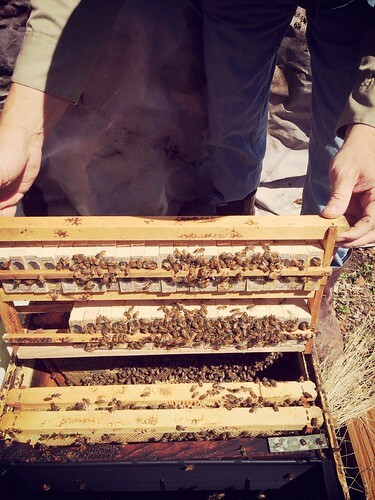 On the beekeeping front, Mark is doing really well with his requeening project. Down to one yard left to be completely done. Yay! He’s been pushing it and is pretty much tired out by evening time each day but I’m so proud of him. 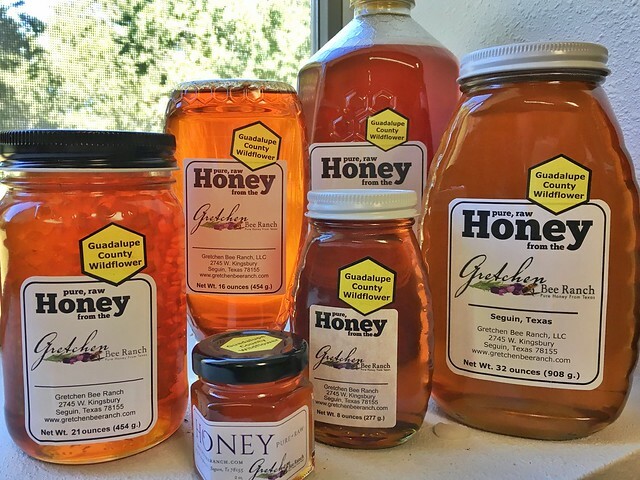 Besides the bee work and candle work and beeswax testing, Honey House construction and some administrative work, Mark found a little time to check out some merchandise at our favorite home goods and gift shop here in town – Gift & Gourmet. They had a big warehouse sale today and boy did we strike it rich! Mark actually was taking some stuff to store there at the warehouse Mary graciously is letting us use and he couldn’t get in. Tough luck. lol BUT in the process, we scored a couple of awesome display shelves – one with lights even! That will show off the products very nicely we think. We also purchased several very lovely display racks and ornament trees. What a gift – we didn’t like what we’d seen last night during our research of ornament display trees and this serendipitous shopping excursion pretty much has us set for a while in terms of product display furniture. Nice. 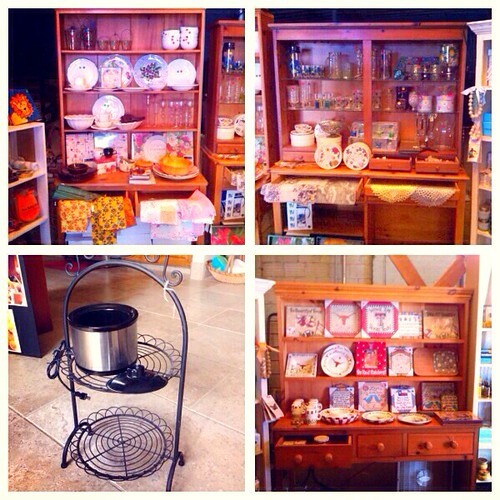 Oh yes, in the picture below, I did a collage of the three cabinets Mark sent pictures of for my input. We didn’t buy all of these but I still couldn’t get over the fact that they were so affordable and better yet, that we’d have many pieces of our favorite shop in our own shop. That’s so special to us. We love Mary and her staff and all the wonderful things they do for us as well as for the community. They are just awesome folks. The bottom left picture is the ONE shot I thought to snap of a display rack and the mini-crockpot is actually for wax melting. Smells lovely and will be going with us to market since our double tent will now have electricity! woohoo – we are moving on up, eh? I was so excited about personal shopping that I totally forgot to shoot anything of all the other super cool pieces we bought for the bee biz. haha, I am bad! By the time I got there and saw the outrageously low prices, I went into Christmas gift shopping mode for family and girlfriends. It was awesome. And fun. Things and people were everywhere. To get out from “behind the scenes” where Mary treated us to some special treasures, we actually climbed through the bottom shelf of a display cabinet. Talk about fun. And even Mark did it. He said it is a good thing he’s dropped 40 pounds recently. hehe Wish you could have seen us. 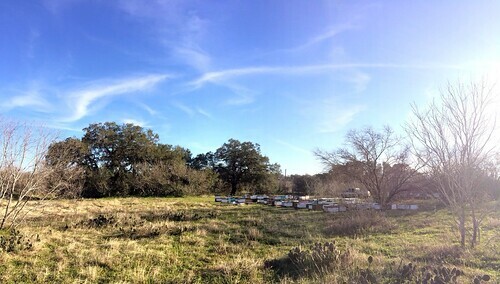 Late afternoon brought a few customers to the Bee Ranch. This is a fairly new beekeeper who’s enjoyed his two hives so much, he is on the list for several more nucs come next spring. Love to hear that. Today he was picking up two queens so he and Mark discussed the direct introduction method for his new queen installation. Hopefully he will have as much success as we have had with that way of doing the queen intros. 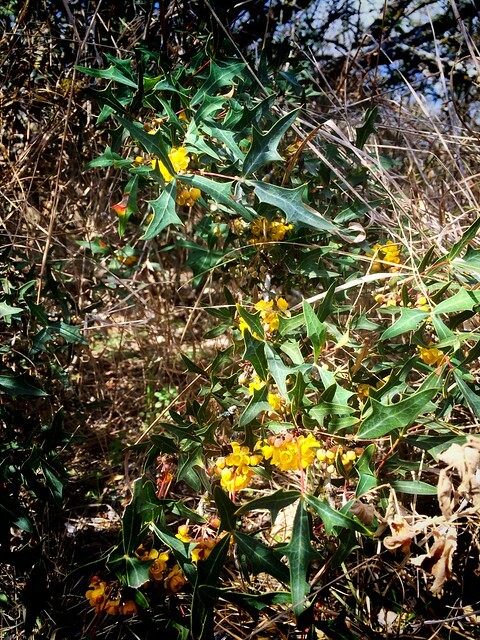 Later I will share with your our other visitor – a florist from north of Austin. 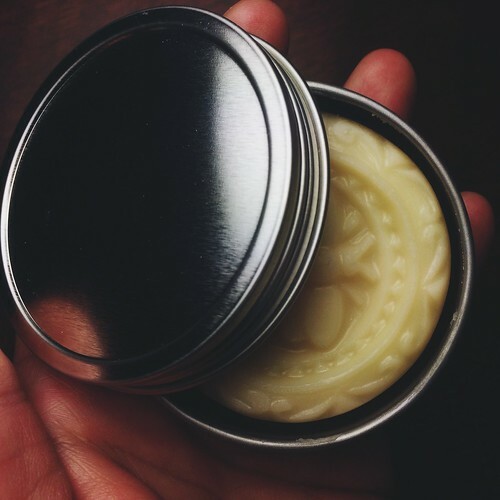 We have partnered with them and are honored and thrilled they want to share our honey and beeswax products with their customers. Can’t wait to post about that when the time is right. 🙂 For now, I bid you a goodnight. Sleep well.